The nonoxidative conversion of methane to aromatic hydrocarbons in the presence of a high-silica ZSM-5 zeolite modified with molybdenum and rhenium nanopowders has been studied. Data on the acid characteristics of the catalysts have been derived by temperature-programmed desorption of ammonia. The microstructure and composition of the Re/ZSM-5 and Re–Mo/ZSM-5 catalyst systems have been studied by transmission electron microscopy. 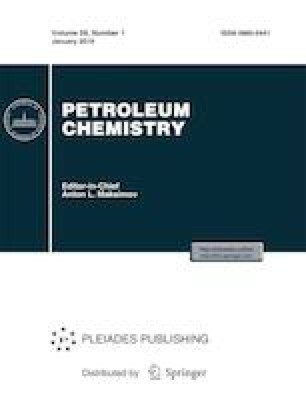 It has been shown that modification of a Mo-containing zeolite with rhenium leads to an increase in the activity and stability of the catalyst in the methane dehydroaromatization reaction. This work was performed under the Basic Research Program of State Academies of Sciences, project no. V.46.2.1.